Here’s a fascinating paper from the Harvard Election Data Archive that attempts to project how many Congressional seats each party will win based on statewide performance. Based on the 2008 presidential election results, twenty-two of the twenty-three current Republican members of Congress will be in districts in which Republicans are expected to receive 55 percent of the vote or more, and eight of the nine current Democratic members of Congress will be in districts in which Democrats are expected to receive 55 percent of the vote or more. Democrat Lloyd Doggett’s 25th district will go from 60% Democratic to 55% Republican. Of the four new districts, two are districts where we expect Republicans to receive 55% or the vote or more, and two are districts where we expect Democrats to receive 55% of the vote or more. Consequently, if Doggett is defeated due to the shift of his district from heavily Democratic to Republican, the Republicans will increase their congressional delegation from twenty-three to twenty six seats, and the Democrats from nine to ten seats. Analysis of the plan also allows us to project the likely division of the legislature for different (hypothetical) divisions of the vote statewide. We plot these results on a seats-votes curve, where each point on the plot represents the percentage of seats that would be won by the Democrats for the given vote share. This curve reveals two important features of this plan. 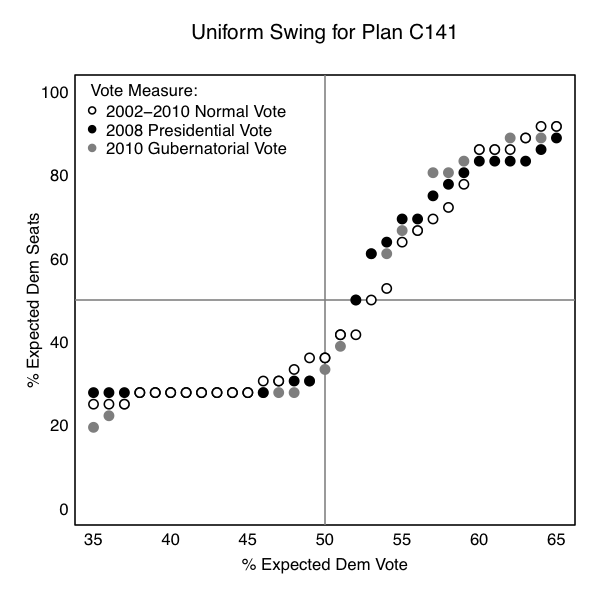 First, the plan has a partisan bias of 14-17%. Rather than winning 50% of the seats in the hypothetical case where the Democrats win 50% of the vote, the Democrats would win only 43-46% of the seats. To win 50% of the seats, the Democrats would need to win roughly 52-53% of the vote. Second, the number of seats won by each party is constant for any Democratic share of the vote between thirty-seven and forty-eight percent. This range includes the recent statewide performance of most Democratic candidates over the last ten years, which has averaged 42%. This flat portion of the seats-votes curve indicates extremely low competitiveness in almost all of the congressional districts under this plan. Thus, the plan is not responsive to small changes in the vote share of either party in the range of vote shares that we expect in the next elections. All of the changes in the makeup of Texas’ congressional delegation are likely to be the result of the partisan decisions in the redistricting process, rather than from competitive congressional elections. I don’t know what methodology they used, so I can’t evaluate that, and their graph isn’t very detailed and probably not exactly to scale – it sure looks to me like the step to an 11th Democratic seat comes at a lower point than 48% – but this is interesting anyway. If you look at the most recent table of 2008 electoral data that I posted, you can surmise which seats are most likely to flip in a better-than-expected year by the Dems. Obviously, there are plenty of other factors in play here – individual Congressfolk can outpace or lag the party average in their district based on their own individual qualities and those of their opponents – and external factors like demography and increased restrictions on voter eligibility may skew things further. But as I’ve said before, the opportunity to pick up a couple of Congressional seats should be a compelling reason for Team Obama to campaign in Texas next year. There has also now been a lawsuit filed by LULAC in the U.S. District Court’s Western District of Texas. That too may wind up being consolidated with other litigation, though as Greg notes this is probably the one to watch. If the previous two decades are any indicator, we should expect to see some kind of system edit for the 2016 elections.